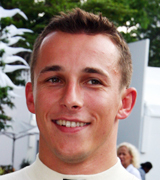 Christian Klien came into Formula One through a well-trodden route, starting in karts and then moving to Formula BMW. In 2004 he was signed up to drive alongside Mark Webber for Jaguar and performed well, even outqualifying his team-mate on one occasion, but a sixth place in Belgium was his only points-scoring finish. Jaguar were bought out by Red Bull in 2005 and Klien retained his seat, this time alongside David Coulthard. He started the season with two points-scoring finishes before making way for the team's third driver, Tonio Liuzzi. Klien returned mid-season and finished with his best result of fifth in China. In 2006 he again started well, qualifying in the top ten in the first two grands prix, but struggled thereafter it was announced in August he would not be retained and he was dropped for the last three races. In 2007 he tested with Honda and Spyker, and was Sauber's test driver in 2008 and 2009, as well as taking part in various sports car events. He was tipped to be HRT's reserve driver in 2010 but the spot went to Sakon Yamamoto; in the event, the team did sign him mid season and in September he got his chance when replacing an ill Yamamoto in Singapore.